Let’s face it: Most people would rather glance at vibrant images than trudge through a sea of copy. Savvy marketers are capitalizing on this universal truth. In fact, 90 percent of information transferred to the brain is visual, which means that across social media, websites, and other digital properties, the brand with the most engaging visual content will win the eyes and hearts of consumers. Although brand marketers once raved that “content is king,” digital advertisers should think more along the lines of “a picture is worth a thousand words.” In a 2012 study, ROI Research found that social media users enjoy pictures more than any other type of post. Along with the growth of mobile, this stat should compel native advertisers to ramp up their visual advertising. But with only an image and 140 characters or less, how do you successfully measure ROI for your advertising efforts? Click-through rates are typically the gold standard for measuring a campaign’s success. You can tell whether your content compelled visitors to click through to your site. 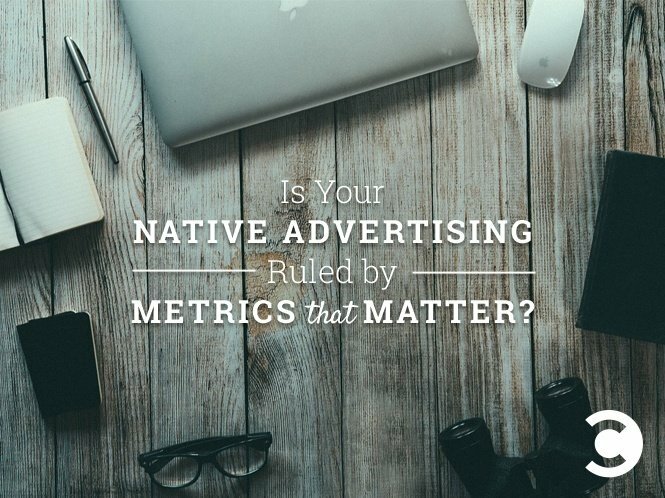 But native ads leave a lingering brand impression on viewers, even if they didn’t continue on to your website. By prioritizing CTRs alone, you’re painting an incomplete picture of campaign success and discounting the powerful brand-building effects that accompany a stellar native campaign. You could have multiple objectives for your native advertising, but branding goals typically fall into two buckets: Campaigns with no immediate action required or campaigns driven specifically toward conversions. To accurately gauge success, you need to nail down your goals before launching a campaign. Take auto companies like Subaru, for example. These brands run native Instagram ads not with the expectation of sales, but with the goal of generating engagement and reach. How much time is spent on the brand page? Not all clicks are created equal. This metric allows you to qualify the types of clicks to more accurately measure their value. During a native ad campaign, pay attention to things like bounce rate, average time spent on page, and engagement levels during the visit. Even if it doesn’t result in an instant conversion, users may be spending a long time on your page, and your campaign may still be generating value. How many conversions did the campaign drive? Remember: A conversion driven by native advertising doesn’t always have to be a sale. It can be a download, an email signup, or any other action that connects a potential customer with your brand. Analyze the types of conversions your sponsored content generates to understand the actions the ad has spurred within the publication’s audience. This data can help your marketing team identify behavioral patterns and proactively account for these actions in the future to help drive more quality conversions. Deploying a compelling native ad campaign involves many moving parts. Thankfully, there are a few steps you can take to maximize exposure and safeguard your campaign’s success. Be completely honest. Make sure you’re fully transparent with your ads and label them as obvious sponsored content. This is the number one thing you can do to build trust with consumers. Establish your metrics up front. Don’t start a campaign without knowing what you’ll measure. Clicks are a great place to start, but also prioritize time spent on site and desired conversions. Go mobile. Over the past few years, marketing conversations have centered around mobile—and for good reason. Nearly everyone has a smartphone, and usage shows no signs of slowing down, with consumers spending seven more hours a month on these devices than they did in 2013. Make sure your campaign is mobile-friendly so you can reach all of these users. Use targeting to pinpoint your audience. Consider demographics, behaviors, and the platform when deciding who to target. Ideally, you want to find an ad network that can use your CRM data to target your exact potential consumer within the network. Create out-of-this-world ad copy. Be positive, and make a statement—but don’t shout. Users see all caps and excessive exclamation points as overbearing or inauthentic. You can entice clicks and engagement by including leading statements or questions. Make readers want to know more. Write a killer headline. Headlines can stand alone (with the image) or be accompanied by additional copy, so don’t duplicate the ad copy. Create unique headlines that make sense, grab the reader’s attention, and relate to your marketing message. Remember to include active visuals. Choose your image carefully, and A/B test everything. Sometimes swapping out images is much more effective than changing ad copy for increasing engagement. Nobody wants to see a model. Consumers want to see real-life people in natural settings, so don’t incorporate images that look staged or posed. Native advertising is here to stay, but it’s still in its beginning stages. As we learn more—and mobile continues to explode—new metrics and benchmarks for success will inevitably emerge. But at the end of the day, your goal is to create beautiful ads that intrigue and inspire your audience, keeping your brand on top of everyone’s mind. Ash Nashed is founder and chief executive officer of Adblade, one of the industry’s largest and safest advertising networks with more than 140 million unique monthly users.